Are you tired of staring at that pile of dishes in your sink? Consider purchasing a KitchenAid dishwasher. They have many great models, which sometimes makes choosing a bit overwhelming. But, we've reviewed all of the top Kitchenaid dishwashers and gathered all the information you need. KitchenAid is a household name, for good reason. When choosing the best dishwasher for your family, you first need all of that information. Starting with a company as dedicated to quality and looks as Kitchenaid for a dishwasher is a great idea. KitchenAid offers a great line of dishwashers for nearly every budget. Although they are not on the cheapest end of the dishwasher spectrum, you get what you pay for when it comes to this brand. Owning a KitchenAid dishwasher can help you in many aspects of your life. First of all, they are great for the environment and your bank account. All of their dishwashers are energy and water efficient. That means that they are more environmentally friendly because they are using fewer resources. Since you are using fewer resources, you'll save money on both your water and electric bill. Not only will you be saving money every month when you use a KitchenAid dishwasher, but you'll have cleaner dishes as well. One of the reasons people willingly pay a little more money for a KitchenAid dishwasher compared to other brands is the quality of their products and the options. KitchenAid has some of the most customizable dishwashers on the market. Not only do they have many options for customizing how you wash your dishes, but they care a lot about aesthetics as well. KitchenAid offers a bunch of different designs for their dishwashers. Even the least expensive models look sleek and high-end. A KitchenAid dishwasher can cost anywhere from $550 for their low-end models to almost $1,950 for the top of the line options. This might seem like a drastic price range for dishwashers, but they are both great options depending on what you are looking for, and what your budget is. The KitchenAid KDFE104DSS, currently on clearance at BestBuy for $549.99, has a regular price of $764.99. 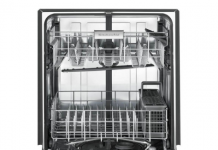 It is a built-in dishwasher and comes in stainless steel, black, and white. Even though it is one of the most affordable KitchenAid dishwashers, it has high-end features like capacitive touch controls. The most expensive KitchenAid dishwasher is the KitchenAid KDTM804EBS, sold by BestBuy for $1,934.99. One of the unique things about this dishwasher compared to all the other models and brands available is the window. It has a lit interior and window that allows a clear view of your dishes as they wash. No more staying up all night washing your dishes — now you can watch them instead! KitchenAid also has many dishwashers between these prices. Although each KitchenAid dishwasher is of excellent quality, paying more does mean you will get more. It is essential to first list of all your necessities when shopping for a new dishwasher so that you can make sure you are getting everything you want. The KitchenAid KDFE104DBL will cost you $549.99 at BestBuy. This is the lowest price you can get a KitchenAid dishwasher for unless you buy one used or as an open box model. This dishwasher holds up to 14 place settings. It also has the electronic capacitive touch controls that are a standard on all KitchenAid dishwashers. It has six cycle options, including express wash and touch. The express wash cleans your lightly soiled dishes quickly. The tough wash is perfect for stuck on food and grime. Some of the cons of this dishwasher are that it only has two racks, compared to some of the more expensive options which have three. It also lacks the popular steam cleaning option. 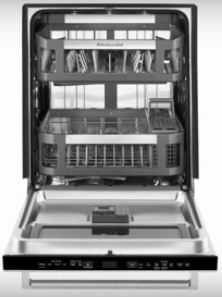 This is a great dishwasher for anyone who wants a few useful options and appreciates a high tech look. It's at 4.5 out of 5 stars on BestBuy's website, with 1,169 reviews total. Many people say it is quiet, user-friendly and cleans well. There are complaints that the front door of the dishwasher doesn't go down all the way. 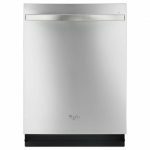 KitchenAid dishwasher KDFE104DWH costs the same, at $549.99, and is the last option for dishwashers under almost $600 in the KitchenAid line. This dishwasher comes in black, stainless steel, and white. It also has the electronic capacitive touch controls and holds 14 place settings — just like the previous model. The upper rack has adjustable tongs for custom placement. This is a great feature, as fits all your pots and pans in your dishwasher without all the hassle of non-adjustable tongs. KitchenAid also has a plastic cup shelf rack that can fit on the upper rack as well. The con for this dishwasher is that, like the previous model, it only has two racks and does not have steam cleaning. It's at 4.5 out of 5 stars on BestBuy's website. Many people love the cleaning capability of this dishwasher. There are, however, complaints about the bottom rack coming off the tracks very easily. 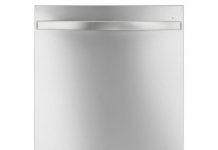 The 24" built-in KitchenAid dishwasher is $699.99 at BestBuy, on sale from $764.99. 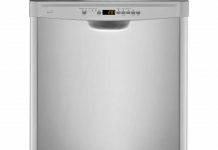 This dishwasher costs significantly more than the model priced right below it, but it has some impressive features. First of all, it just looks cool. The smudge-resistant PrintShield Finish means no worries about little fingerprints all over your dishwasher. It has a pre-wash cycle that can detect the soil level of your dishes and then makes adjustments to the cycle so that your dishes come out perfectly clean. It also has a high-temperature wash setting. This can help reduce bacteria during the washing and drying process. The design is the position of the capacitive touch controls is somewhat lacking. They are placed slightly under the handle, which can make seeing the options a bit difficult. It gets 5 out of 5 stars on BestBuy's website. People love the quietness of the dishwasher, but mention that the wash does take longer than with the older KitchenAid models. KitchenAid's KDFE104HPS model will cost you $699.99 at BestBuy. It comes in black stainless steel, silver stainless steel, and regular black and white. All of the options have a stainless steel tub, which helps facilitate drying and keep the temperature hot while using less electricity. It accommodates 14 place settings. It has a sanitize option which helps reduce bacteria. There is a heated dry option as well. The top shelf has folding sections that easily create space for utensils, cups and oddly shaped dishes. The two, four, and eight-hour delay-start options allows programming your dishwasher so it run whenever is most convenient for you. It comes in at 5 out of 5 stars on BestBuy's website. People are very pleased with their purchase. This is the price level where you start seeing some great additions to the standard features. Costing $749.99 at BestBuy, this KitchenAid dishwasher has three shelves instead of two. It comes in black and regular stainless steel with a beautifully designed pocket handle. The buttons that control the dishwasher are on top of the door, which means you'll never worry about little children playing around with it and changing your settings. It has a recessed heating core which ensures that all of your dishes will dry completely. Keep in mind that even though this model has an additional shelf, according to the description on BestBuy's website, it still only holds 14 place settings. It is rated 4.7 out of 5 stars on BestBuy's website. People love the design and how easy keeping it clean is. There are some complaints that despite claims it completely dries dishes, it does not always do a great job in that area. Moving up a tiny bit in price is the KitchenAid KDFE104HBS which is $799.99 at BestBuy. This model comes in white, black, stainless steel and black stainless steel. There is the same pocket handle as some of the lower priced models. The two racks with a fold-down shelf that is great for washing wine glasses. It holds 14 place settings and has an eight-hour delay start. 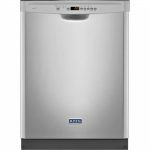 While there are no major cons to this dishwasher, it doesn't offer many additional options compared to lower-priced models. It is rated 5 out of 5 stars. The inside stainless steel tub and the top rack are major pros for this model. Coming in at $854.99, this KitchenAid dishwasher is priced relatively well for all the features it has. It comes in the four standard colors for KitchenAid dishwashers as listed above. This model has a unique bar handle, with the buttons found on the top of the dishwasher door. The PrintShield finish on the stainless steel options cleans easily using only a cloth and water. It has six settings, including ProWash which will determine the soil level of your dishes. You can choose between two drying options. The heated dry will dry your dishes quickly while the energy saver uses a heat-free drying option. One of the cons of this model is that it is still limited in space, holding only 14 place settings. At 3.9 out of 5 stars, people love how well it cleans and how quiet it is. There are some complaints about the handlebar being too large. Are you one of those people who love the convenience of a dishwasher but hate how they look? Then this KitchenAid dishwasher was made for you. Priced at $944.99 it is custom panel ready. Choose from a large variety of options so that the front of the dishwasher matches your existing cabinets. It has a third rack for small items such as spatulas, prep bowls, and measuring cups. The three wash arms and 40 jets are no competition for stuck on food. This one comes in at 4.6 out of 5 stars. People love the Pro-Scrub cycles but are not impressed with the third rack. This KitchenAid dishwasher is $1,034.99 at BestBuy. It comes in regular stainless steel and black stainless steel. It has spray nozzles that ensure all of your vases and bottles will be clean inside and out. There are five cycles and six additional options. The best choice for anyone who has children is the bottle wash. This ensures that all bottles wash at a higher temperature and prevents bacteria. There is also a sanitizer rinse option which will wash all your dishes at a higher than normal temperature. Although this dishwasher does have some great options, it still lacks in space. This one is at 4.7 out of 5 stars. Many of the reviews state that it does a great job at washing dishes, but can take a long time. This KitchenAid dishwasher is the top of the line for their home dishwashers. It costs $1,844.99 at BestBuy. This dishwasher is unique because it features a window. This is great for seeing your dishes wash so you know where they are in the cycle, or keeping a toddler entertained. It has hidden top control buttons which adds to the sleek look. There are four spray nozzles on the upper rack that you can put into tall bottles or glasses ensuring that they clean correctly. These work great for water bottles with lots of curves and grooves. The advanced drying system draws out moisture using a fan, which also helps use less electricity during the drying process. It has 4.5 out of 5 stars. People love how well it cleans dishes, although there are complaints about the height of the racks. Although KitchenAid might cost a bit more than other dishwasher brands, with a KitchenAid dishwasher, you know you are getting quality. They all come with a one-year warranty, so you no worries about spending a significant amount of money on something that might break in a few months.